"Generate Value from Your SAP Transport Management System(SAP TMS)"
Generate Value from your SAP Transport Management System (SAP TMS) through product demonstrations, proof-of-concepts, feasibility studies and end-to-end implementations. SAP Transportation Management Systems offers a variety of processes and functions that customers can implement over time to extract value. What are the deployment and transformation aspects of a SAP Transport Management System initiative? How to extract value from a new Transport Management System in SAP ? What are the criteria to select a Transportation Management System in SAP ?How to select the right SAP Transportation Management System that fits your organization's needs? How to start or accompany your own SAP Transport Management System initiative? 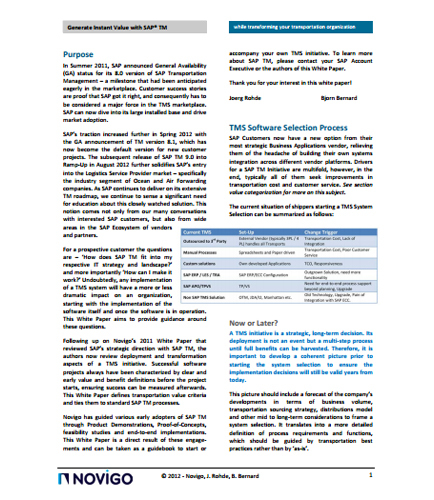 How does SAP TMS fit into your respective IT strategy and landscape? Download this ''SAP Transport Management System PDF'' that focuses on how to drive the most value from a SAP Transport Management initiative.